Why pay for language training when there is so much free material online? I can answer this question both as a language learner and a teacher. I’m not against free material. In fact, I encourage my customers to go out and find free material that they like, so they can use it to develop their skills between lessons. As a language trainer, I also provide a number of free factsheets, a free audio course, a podcast and a free Facebook group. I think there is a lot of good, free material out there, and if you don’t have a budget for language learning, you can definitely make progress – both by using free materials for language learners, and also articles, videos or podcasts in the language that you want to learn. However, as a learner, I’ve also paid for German and Turkish courses. These are some of the reasons why I chose paid lessons. Sometimes the fact that there is so much material out there is part of the problem. Which materials should you use to help you study? Are the materials that you have found good? Are they the right level for you? If you’re doing personalised training with a language trainer, they should take the time to get to know what you want, why you want to learn a language, and what level you are at the moment. They will then be able to select relevant and appropriate materials for you. This will save you time because you won’t have to go through pages and pages of information to find the right materials. It will also prevent you from struggling with things that are too advanced and getting bored with things that are too easy. If you’re taking part in a course, you should be able to see a breakdown of the modules and what they cover (See my business English course as an example).After looking at the course, you can decide whether it’s right for you and whether it will meet your needs. Sometimes information that you can find on the internet is out of date. 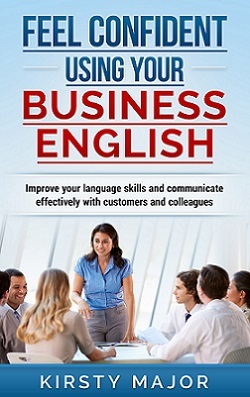 I cringe when I see some of the phrases that people are advised to use in business English. We just don’t say these things any more, and rather than making a good impression, the phrases might drive customers or potential employers away. Someone who is familiar with current language trends and who has worked in an English-speaking country will be in a better position to advise on what language is appropriate. Some online resources are great. Others are terrible. It’s so easy now to communicate with other people online. Anyone can set up a Facebook page, a blog or a Youtube channel. Someone in my Facebook group showed me a couple of videos that she had been watching to improve her English. One of them was really good, but one was full of mistakes. The intention was no doubt good, but the quality was not, because there were a number of mistakes in the content. That’s not to say that there aren’t teachers out there who don’t offer value for money. As in any profession, there are good and bad teachers! However, unlike Youtubers or blog writers, teachers generally have to provide some information about their qualifications, experience and the way in which they work with students. Some will also make customer feedback available on their sites. Using this information, it’s easier to work out whose training courses will best meet your needs, and who is likely to be a reliable source of good English. If you want to improve your vocabulary, reading articles and listening to audio material is great because it exposes you to a lot of new words. There are also tests and activities that you can do online to test your grammar skills. However, these tests only tell you whether you got the question right or wrong. They rarely give explanations as to why the correct answer is right, or perhaps more importantly, why your answer was wrong. When I’m teaching grammar, the main goal is not for the learner to get all of the questions right, although I want them to do this as well. It’s more important that they understand the reasons behind what they are doing, and that is not so easy if you just get a computer-generated score such as 15 out of 20. It’s even harder when it comes to written or spoken language. A computer programme may mark your sentence as incorrect, even though it’s just an equally valid variation on the answer it was expecting. I’ve found that the best way to get actionable feedback on my speaking and writing in German and Turkish was to get help from a trainer. Firstly because they could correct my mistakes, and secondly because they could explain why my sentence was wrong, so that I could try to avoid making the same mistake again. A tandem partner who is also a native speaker may be able to do this too, but they won’t necessarily be able to explain the rules. Google is usually the first place that I go when I have a question. However, sometimes Google gives multiple or conflicting answers, and sometimes it takes a bit of time to wade through the results before I find what I am looking for. I have had good results when I’ve asked questions in free Facebook language groups, but the quality of the answers depends on whose around, and sometimes the thread descends into a discussion among native speakers who can’t agree. This didn’t help me as a learner and I used to appreciate the fact that I could ask my trainer directly. Some days you feel really motivated. Other days you can’t be bothered, or struggle to find time to fit in your language practice. This is normal, but knowing that you have to complete your homework by a certain date or come prepared for a lesson is a good way to make sure that the job gets done. You can have similar arrangements with language tandems, but this relies on both parties being committed to sticking to the deadlines you set yourselves. As a language learner, I had best results when I used a combination of training that I’d bought, and free materials, not all of them specifically for language learners, that I used to help me practise what I’d learned in my lessons. I offer free training through my podcast and my Facebook group. I also offer one-to-one training – prices are on the lessons page.